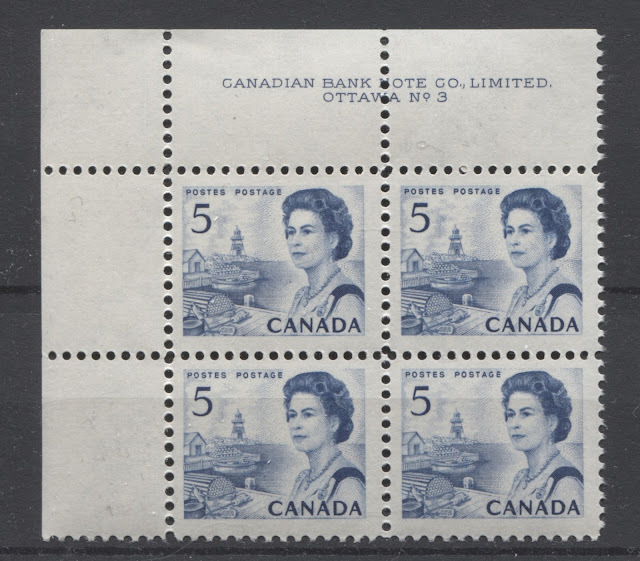 This variety is found on selected 25c booklets printed by the BABN that contained the 1c, 6c and 8c stamps, that were first issued on December 30, 1971. 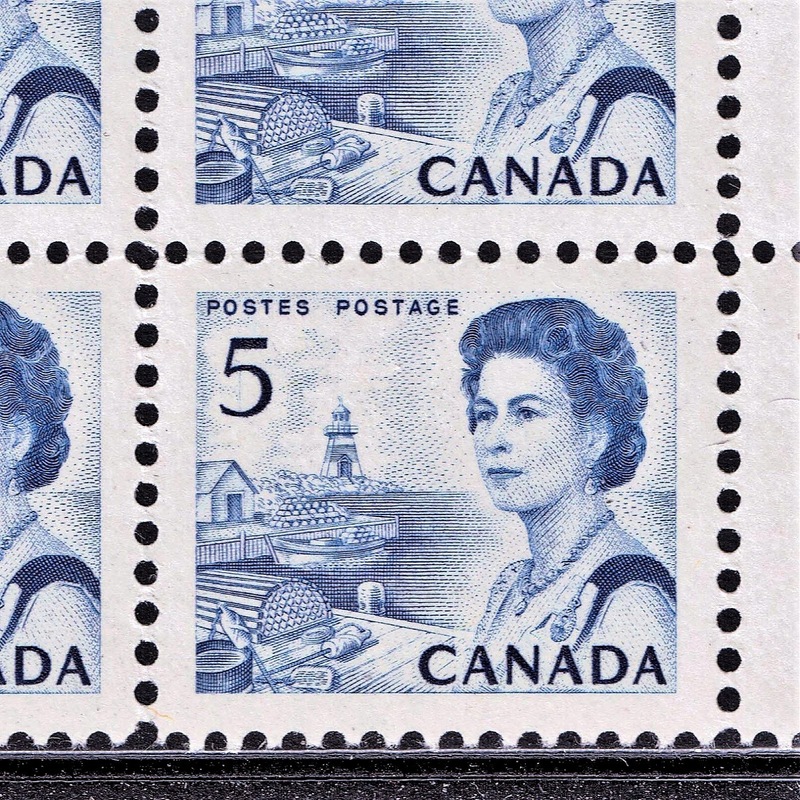 It is constant in the sense, that it is always found on the same stamp when it occurs: the 1c stamp from the middle row of the booklet. It is quite a prominent variety, being visible to the naked eye, without a magnifying glass. However, it is not found on every example of the 25c booklets that were printed, but only on a few printings. It consists of a blob of colour appearing in the sky roughly in the middle of the design as shown in the above scan. 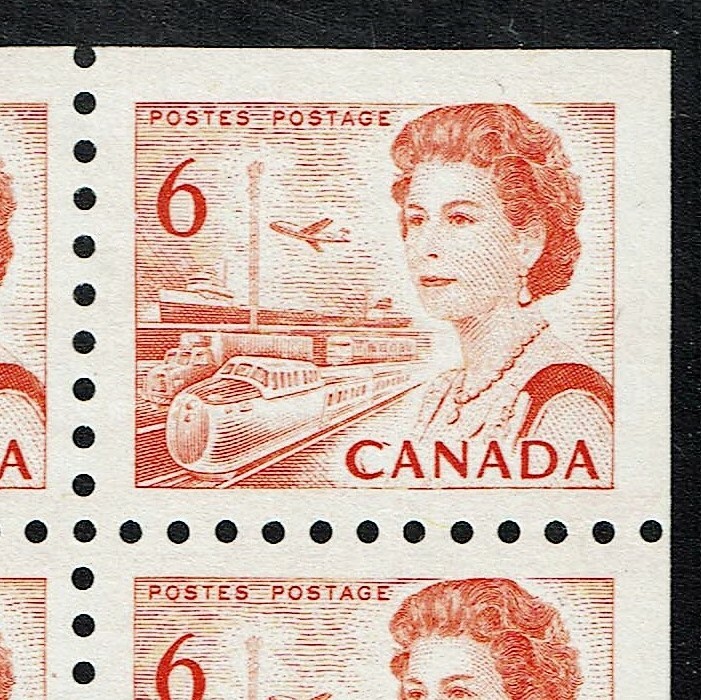 This is the 25c booklet with the brown motorized vehicle design on the front cover, the "Pre-stamped envelopes" slogan in the inside front cover, and the clear sealing strip. It is printed with the medium fluorescent paper, that has 3 mm OP-4 tagging. The OP-4 tagging was only used between December 30, 1971 and about mid-1972 to late 1972. So it would appear that the variety likely occurs in the later printings of this booklet, as opposed to the earlier ones. This is a very easy variety to miss, as the Unitrade illustration has been enhanced to make the line appear much deeper and stronger than it actually appears most of the time. The variety consists of a faint vertical line that joins the top of the "5" near the diagonal downstroke, to the top of the curved portion. It occurred only on position 11 of the upper left pane of plate 3. I know that it only occurs here because it is always found in an upper left plate block, which must come from the upper left pane. You have to look closely in the space between the top of the 5 and the top of the curved portion. However, if you look carefully, you can just make it out. But it is not nearly as obvious as the illustration in Unitrade would lead one to believe. 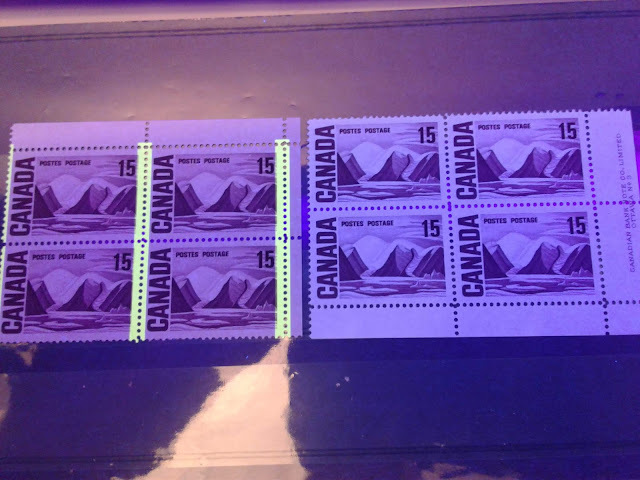 So you have to check carefully when going through your 5c stamps. 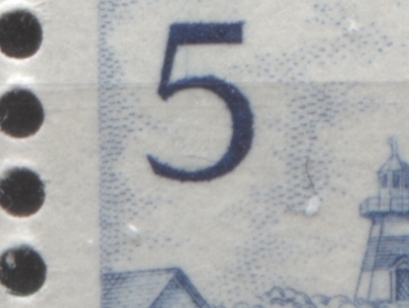 Also, it is critical to look in the right place: not within the curved portion of the "5", but in the space above it, but below the top of the "5". This variety occurs only on the BABN perf. 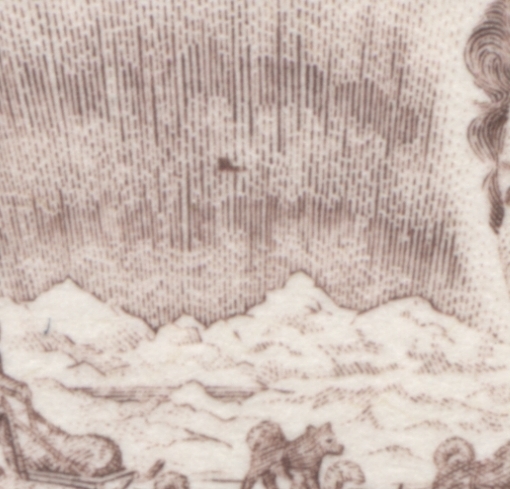 10 printing that was issued in $1 booklets of 20 stamps. 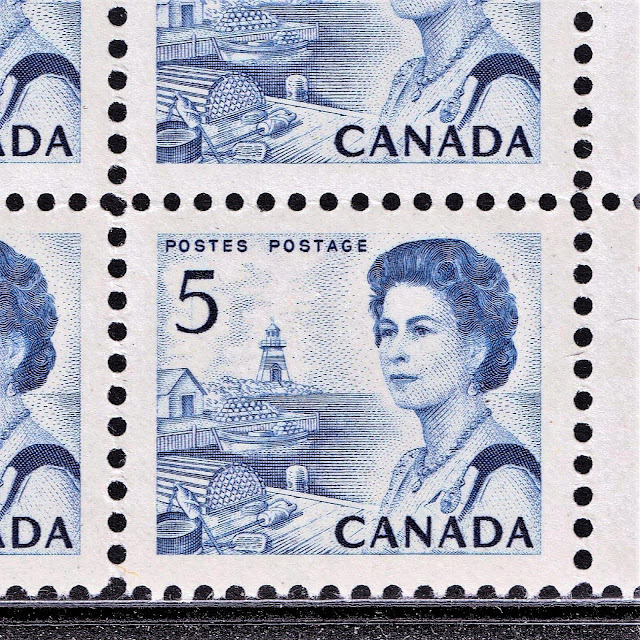 It generally occurs on the second stamp in selected booklets, so it is not perfectly constant. If you look at the above scan, you can see the broken necklace on the right stamp, which appears as a gap between the fourth and fifth pearls. The necklace on the left stamp is the unbroken necklace. If you compare the two, you can very clearly see the difference. It consists of a shadow of a double "C" for the "C" in "Canada", that is placed just to the right of the main letter on the inside. Unitrade notes it's position on the sheet as position 10, but makes no note of whether it comes from plate 1 or plate 2. It is listed as having come only from the perf. 10 printings, which means that it must have originated from one of these two plates. Curiously enough, Unitrade does not list a plate block for this variety, which is odd, because every upper right corner block from the upper right pane should have this variety, if it is indeed from position 10. The above example comes from Douglas Karns, and is indeed from an upper right field stock block, in position 10. This variety was unknown in mint condition until relatively recently. It was first discovered and reported in 1989, some 17 years after the 8c stamp was issued. The variety consists of an extra vertical line at the design. It is very rare, as Robin Harris, the editor of the Unitrade catalogue only managed to find three examples in his examination of 15,000 used examples of this stamp, several years ago. According to Harris, it is thought to have occurred only on printings from plate 4, which were made in 1972, and generally from the top positions in the sheet, though the exact positions are unknown. 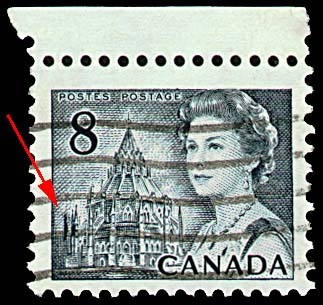 Many collectors will assume then, that it will only occur on stamps with PVA gum. This may indeed be true, but it is important to check all printings including those from the earlier plates, just in case this is not the full story. Enough complete sheets exist that one would expect that the exact plate number and position would have been identified by now. The fact that it has not been positively identified, suggests that it does not occur on every sheet, and only exists on certain printings. That concludes my discussion of these varieties for this week - a very short post compared to my others. However, next week's post will be much longer, as I will be getting into the "blinky flaws" or "totem pole eyes" on the 2c green next week, and I expect that illustrating and describing most of the 33 known varieties, will take a considerable amount of time.